With the date and time picker field you can show a a date picker, time picker, or a picker with both date and time to the user. The saved values are stored in the database in ISO 8601-format , so the saved dates should be fine to sort when using for example WP_Query. 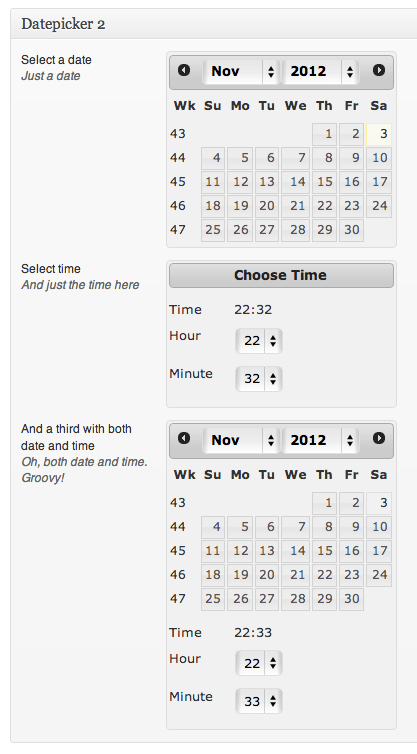 An array will lots of useful info about the selected date and/or time. 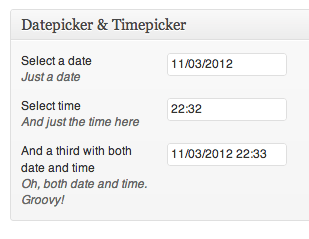 The returned values are different depending on if you show a date picker, a time picker, or a date and time picker. // Gets all posts from a custom post type called "calendar"
I want only time in the form like 12:00 without am and Pm . I’m trying since yesterday to change the color of the date square when active (wanted a brighter color ), the css seems to be in a jquery library, so i searched the link in the plug-in files to change it or try to customize via jquery libraries but i didn’t found it anywhere. Is there a solution to solve this problem ?